The easiest way to transfrom anything is with paint. In this before and after I use a chair as an example. Dining chairs don't require a lot of fabric so you can splurge a little. Figure 1/2 yard per chair. So for this chair I selected Robert Allen Beach Day in Sprout. Retail price per yard is $66. 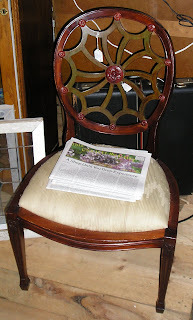 We de-glossed the finish on the chairs with liquid sandpaper, primed with spray can of Kilz and top coated with Benjamin Moore Linen white and lightly distressed the finish. 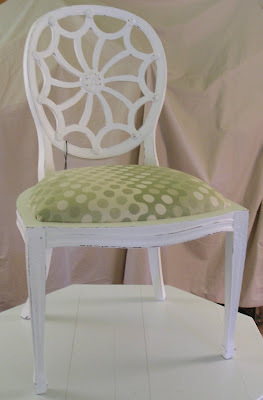 The end result is an elegant chair with a beautiful finsih and fabric. Look around your home and see what you can transform.